Kayak at Long Lake Provincial Park. Long Lake is the centrepiece of Long Lake Provincial Park, a 5000+ acre wilderness oasis that borders on the edge of Halifax’s urban core, only a ten-minute drive from downtown Halifax, and central to the entire city. Long Lake was the City of Halifax’s principal water supply from the mid-1800’s to the 1970’s and a result it has always been protected from adjacent development that could negatively affect its water quality. The result is a 3 km+ long lake on the edge of the city with absolutely pristine water and an uninterrupted, unaltered natural shoreline. Long Lake is a great place to spend several hours of a day traversing the lake and exploring the many inlets, two islands and the old dam that created the lake’s current shape two centuries ago. 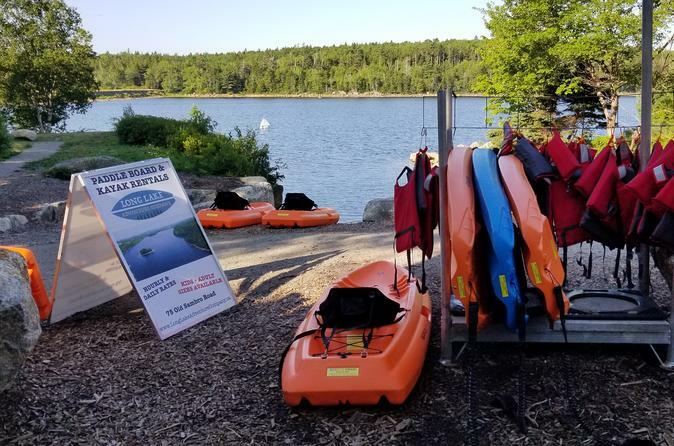 Long Lake Adventure Company is located at 75 Old Sambro Road, Halifax, Nova Scotia, Canada. We are located a mere 10 minutes from downtown Halifax. Limited parking is available onsite with some additional parking available on a few neighbouring side streets. Please arrive 15 minutes before your reservation time so we can check you in. Paddles and lifejackets are supplied. Don't forget your sunscreen, sunglasses, a watch, and water. Minimum rental time is 1 hour in duration but you may want to book for several hours to fully explore the beautiful Provincial park. Water temperatures are very welcoming if you want to swim during your visit.